The Rangers rallied for six runs in the bottom of the seventh inning and held on for an 8-4 victory over the Orioles at Globe Life Park on Saturday night. The Rangers have won two of three over the Orioles in the four-game series that concludes Sunday. The Rangers won even they were out-homered 3-0 by the Orioles. "Our guys continue to grind out at-bats," Rangers manager Jeff Banister said. "The home runs will come for us, but it's about putting runs on the board, putting good at-bats together and capitalizing on your run-scoring opportunities." The Rangers trailed, 4-2, going into the seventh, before Brett Nicholas led off the inning with a walk and went to third on a double by Delino DeShields off of Orioles starter Yovani Gallardo. Manager Buck Showalter then went to his bullpen beginning with left-hander T.J. McFarland, but the Rangers came back for their first victory this season when trailing after six innings. The Orioles wasted three home runs. Manny Machado, Adam Jones and Chris Davis all went deep off of Rangers starter Colby Lewis. The Orioles have hit 23 home runs in their first 11 games. But all three Orioles homers Saturday were solo shots, and they left nine men on base in the game. "One night it's, you got people out there [on base] and you don't get them in, another night it's, you hit a home run and nobody's on base," Showalter said. "It's kind of a tribute to their guy too." Lewis allowed four runs in six innings and left trailing, 4-2. "To kind of keep them at bay for six innings and keep it close, that's all I wanted to do," Lewis said. "Anytime you can keep a team like that close, I felt like our offense is going to eventually get it going." Clutch hitting arrives in seventh: The Rangers were 0-for-5 with runners in scoring position through the sixth inning. 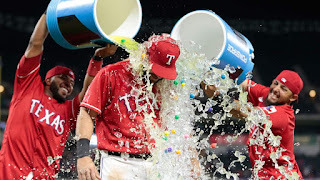 Then they went 4-for-6 in the sixth with an infield single byNomar Mazara, a double by Mitch Moreland against left-hander McFarland after Adrian Beltre was walked intentionally, and a pair of two-out run-scoring singles by Rougned Odorand Elvis Andrus. Jones' mammoth homer puts O's ahead: Tied at 1 to start the third, Jones absolutely hammered a 1-0 Lewis pitch into left-center, hitting it over the visitor's bullpen and into a brick wall 440 feet from the plate. According to Statcast™, Jones' homer left his bat at 108.5 mph. The leadoff homer was Jones' first of the year and gave Baltimore the lead. Beltre drives in two: Beltre drove in the first runs for the Rangers off Gallardo -- both times with runners at the corners and one out. Beltre had a sacrifice fly in the first and brought home another run in the fifth on a slow grounder to third that resulted in a force at second. "It doesn't matter how we score, whether it's by hit, error or home run," Beltre said. "It's all about scoring runs." Diving stops boost Gallardo: Baltimore made some fantastic defensive plays to support Gallardo. In the second inning, second baseman Jonathan Schoop robbed Odor with a diving stop up the middle and quick throw to first. Third baseman Machado contributed an even more dazzling play two innings later, when Andrus ripped a hard bouncer down the third-base line; Machado dove to his right and just managed to field the ball, then threw a dart across the diamond to easily retire Andrus. Machado stymied Andrus again in the sixth, starting a nifty 5-4-3, inning-ending double play with a spinning throw. "They want to make that diving play and help the pitchers out," Gallardo said. "It's obviously a good feeling. … Make them put the ball in play, put the ball on the ground, and they're going to make an exciting play for you." Rangers reliever Keone Kela earned the victory with a scoreless seventh. The victory came on his 23rd birthday. He is the ninth Rangers pitcher to win on his birthday, and the first sinceNick Martinez on Aug. 5 last season. The only other reliever was Wes Littleton on Sept. 2, 2007, against the Angels. Delino DeShields tried to steal second after a leadoff single in the eighth inning, but was thrown out by catcher Matt Wieters. The Rangers challenged the call and a replay review ruled it would stand. Orioles: Righty Mike Wright will start for the Orioles at 3:05 p.m. ET on Sunday. Wright got the win in his only start of 2016 at Boston, pitching five innings and allowing four runs on five hits. Wright has never faced the Rangers. Rangers: Derek Holland starts for the Rangers against the Orioles at 2:05 p.m. CT on Sunday in Arlington. This is the final of a four-game series. The Rangers have lost three of their first four day games.